I feel very sorry for the city and its people. Terrorism happens everywhere now... and we need to fight the cause of it instead of looking for scape goats. I hope those lost and misguided sheeps would one day realize that the true path to equality and peace is through non-violence and tolerance. Hoping that it gets detonated soon! I feel very sad about those two hotels. 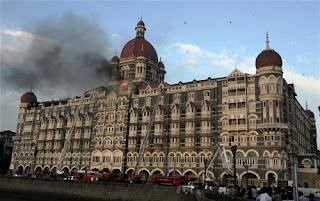 My good memories are linked with Taj and Oberoi. After my engagement, for the first time when I took her out it was in Samarkand, Oberoi. I was used to buy my son's birthday cakes every year from Taj. So may times I have visited Taj for dinner and Oberoi for Buffet Lunch in Palms.